A week or so ago, David and I were watching Keith Olbermann’s “Countdown” on MSNBC. As the tagline to one of the stories, Keith quoted, “I drink your milkshake!” David was puzzled and asked why that sentence was suddenly popping up all over the place. I reminded him that Daniel Plainview says that line in the final scene of There Will Be Blood—a film that both of us like very much. 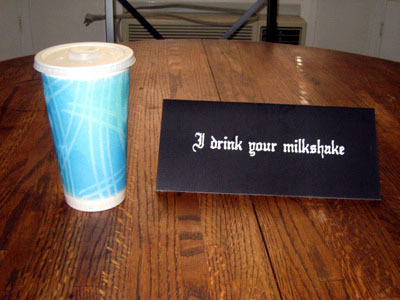 That was when I learned that “I drink your milkshake” had entered the buzz of pop culture. Why so very strange? Odd, maybe, but it makes perfect sense in context. It comes in the film’s final scene, set in the bowling alley of Daniel’s mansion. Naive preacher Eli Sunday has just told Daniel that he should buy a last bit of oil-rich land, whose owner had earlier refused to sell. Daniel replies that he has already extracted the oil from that plot. Daniel replies, “I’d be happy to work with you.” But he adds a condition: Eli must state that he is a false prophet and that God is a superstition. After receiving Daniel’s apparent agreement to financial terms, Eli reluctantly makes these statements over and over as Daniel insists that he speak more forcefully. At this point Daniel throws Eli down, begins hurling bowling balls and pins at him, and finally beats him to death. The milkshake analogy isn’t all that bizarre. Daniel choses a metaphor for drainage that he thinks Eli can understand. Beyond that, the milkshake speech is a way of emphasizing Daniel’s delight, not just in making a fortune in the oil business, but in doing so by paying little, or in this case no, money to those whose land he exploits. Stealing someone’s milkshake is a petty form of theft, so Daniel is able to trivialize the removal of oil that Eli has been counting on as his last chance for financial and spiritual salvation. The taunting also allows Daniel to revenge himself for the parallel earlier scene in the church where Eli had forced him repeatedly to confess how he had betrayed his own son. In this final portion of the film, Daniel no longer has any need to put on a friendly face, to pretend to have empathy with others. Daniel mentions drinking water as well. He’s eating a cold, leftover piece of meat during much of this, and Eli is drinking whiskey. Eating and drinking are common motifs in the film, with elaborate discussions of how the rocky land of the Sundays’ ranch produces no grain but only supports goats. Upon Daniel’s arrival there, the family can offer him no bread but only milk and potatoes. By the way, according to a story in USA Today, director Paul Thomas Anderson derived the dialogue from “a transcript he found of the 1924 congressional hearings over the Teapot Dome scandal.” Sen. Albert Fall described oil drainage thus: “Sir, if you have a milkshake and I have a milkshake and my straw reaches across the room, I’ll end up drinking your milkshake.” He was convicted of taking bribes for oil rights on public lands. Kirschling points out that the speech has spread far indeed. There’s a YouTube video, “There Will Be Milkshakes,” by Kevin Koonz (spelled Kunze in the EW and USA Today stories). There’s a website, “I Drink Your Milkshake.com,” which started as just a posting of the line and became a forum for discussing the film. The USA Today article declares the line “Hollywood’s Hottest Catchphrase.” There are various designs of T-shirts available on Cafepress and eBay. It does seem odd that a line from a film that is an art-house favorite, with under $25 million grossed in the U.S. to date, should spread so widely. But these things happen. True, in a sense. But great art has always been subject to humorous treatment and tends to come through unscathed. Marcel Duchamp stuck a mustache on a reproduction of the Mona Lisa and put it in a museum, and the act is considered a daring stroke of avant-garde art. The 1941 comedy Hellzapoppin’ contains a gag about the Rosebud sled from Citizen Kane. There are innumerable examples. The internet has accelerated such of manipulation of artworks and made us more aware of them, but it’s not new—and it is inevitable. Anderson is no doubt being polite about the video. It’s a typical hastily made mashup with randomly edited images from a trailer juxtaposed with Kelis’ 2003 song “Milkshake.” As Kirschling remarks, “How original!” But you have to believe that as a result of all the fuss quite a few more people will get intrigued and go to see There Will Be Blood than would have otherwise. They’ll certainly have to sit through the whole thing before reaching the moment they came to savor. And, knowing all of the above, I still was able to re-watch that final scene and find it as chilling as it was the first time through. This entry was posted on Monday | February 11, 2008 at 9:10 am	and is filed under Directors: Anderson, Paul Thomas, Film comments, Film history, Film industry, Hollywood: The business, Independent American film. Responses are currently closed, but you can trackback from your own site.